Awwwww cant believe it has been 2 years already! 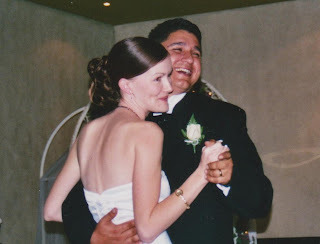 !I love this photo from our wedding day :) Look how happy my honey is.....OMG look how big my hair is LOL!! !Anyway Happy anniversary to my gorgeous husband Allan.....I love you bub!I bought Allan some bits and bobs for when he goes to his car show in a couple of weeks and the Indiana Jones boxed set (he has them on video but our VCR is cactus LOL) and he bought me the most fandabbydosey zoom lense for my SLR!! !Clever man that he is! !I love it! !Cant wait to have a good play with it now! !I need some willing models to photograph!I took a few pic's of fur kid Jack....Kloe wouldnt sit in one spot for long enough LOL! !We will be off out for dinner tonight....hoping to get a few photos before we leave too :) Allan cant say no its our anniversary LOL!! Oh before I forget......do you like my new blog title background??? ?My Mum snapped this pic of me doing as I always do when we where at the beach the other week......I didnt know she was doing it but I like the pic and it is soooooo me LOL!!! i adore the new header it is gorgeous!!! great shot...way to go mum!!! Loving the new look blog header Krissy :) Happy anniversary, what a great pressie! Congrats Krissy!! Wow, great pressie!! Love the header, so so cool!! Woohoo the mojo is back!! A chance to win some gorgeous chippies! !